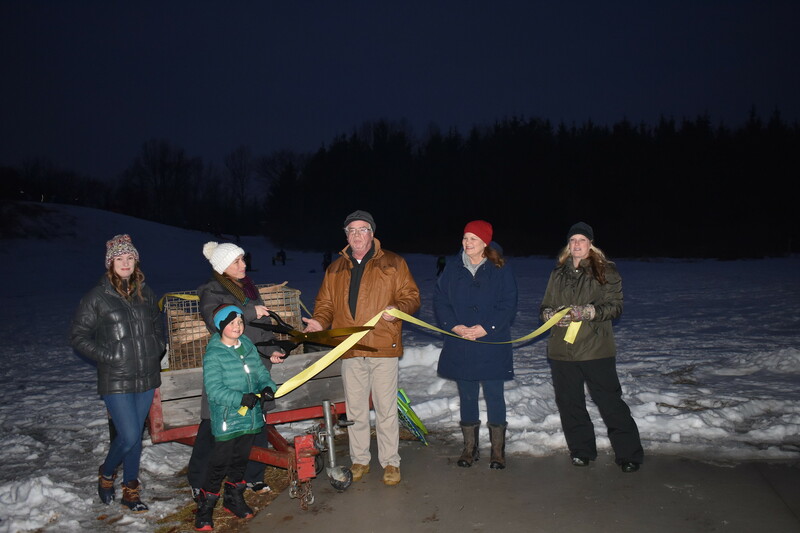 MERIDIAN TOWNSHIP - On Saturday February 2, Meridian Township held a ribbon cutting ceremony with 200 in attendance to celebrate the dedication of a new park pavilion at North Meridian Road Park. North Meridian Road Park is home to the only sledding hill within the Township park system and also hosts hundreds of visitors for spring and fall soccer, cross-country skiing, hiking and bird watching. This $100,000 project was made possible through a $50,000 grant from the Michigan Natural Resources Trust Fund. This fund consists of royalties paid by oil and gas development companies that buy and lease state-owned mineral rights. The funds are used exclusively to purchase and improve land for public recreation and protection of natural features. For more information about the North Meridian Road Park pavilion or Meridian Moonlight Sledding call the Parks & Recreation Department at 517-853-4600 or visit the Meridian Township website.